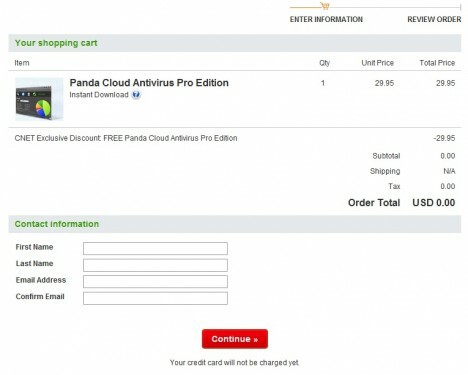 Panda Cloud Antivirus Pro Edition is enhanced protection software and it is based on cloud technology, which provides complete protection shield against spyware, virus, and rootkits. It is having real-time connection with Panda labs for Online Collective intelligence servers to safeguard more quickly against the latest spyware variants while slightly influencing PC performance. It is designed to turn off the Autorun feature that will help to safeguard users from infections that multiply by means of flash drives. Additionally it consists “Automatic USB Vaccination” to retain users from drifting down to destructive activities. Several users do not mind paying out to obtain superior antivirus to keep away from spyware, virus, spams, and harmful activities and provides them peace of mind. But why to pay, if you are able to obtain this fantastic antivirus for free, which costs $29.95? Users will therefore need to type their first name, last name and a valid email id and after that click the Continue button. After filling all, the information users have to confirm and verify email id by click the link in your inbox. After that, users will be redirected to a new website where they will find one-year activation key for your antivirus software. After installing their copy of software, they have to activate their copy with this activation key.